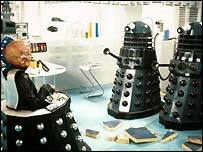 The Daleks, sworn enemies of eccentric timelord Doctor Who, have been voted the most evil villains on TV. The robotic aliens topped a poll that saw Footballers' Wives' Jason Turner (Cristian Solimeno) take second place. Soames Forsyte (Eric Porter) in the 1960s version of The Forsyte Saga took third place. The poll of more than 3,000 GMTV viewers also voted Jewel in the Crown's Ronald Merrick and House of Cards' Francis Urquhart as top villains. The TV drama Cracker - starring Robbie Coltrane as a criminal psychologist - was voted best TV drama of all time. And Inspector Morse, who was played by the late John Thaw, was voted the favourite TV detective, while Sean Bean's Major Richard Sharpe was named top TV hero. He beat Horatio Hornblower and Nick Berry's Pc Nick Rowan from the Yorkshire drama Heartbeat. The Larkins from The Darling Buds Of May were voted the favourite family, and Colin Firth's Mr Darcy from Pride and Prejudice won sexiest TV character category. News of the Daleks' victory comes just weeks after the BBC confirmed that veteran sci-fi series Doctor Who would return to screens after a 14-year gap. The series will be written by Queer As Folk creator Russell T Davies and will be made by BBC Wales. The series began in 1963, with the Doctor battling the warlike Daleks many times through his seven incarnations.